With its splashy, mango-colored exterior, the Tech stands out among everything else in downtown San Jose. Millions have visited the place since it opened at the original location in 1990, which was around the corner on San Carlos Street. The Tech's founders envisioned a world-class facility wholly devoted to science and technology exactly what one would expect from Silicon Valley'nd today people from across the globe have descended upon San Jose to check out its educational displays. 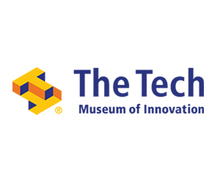 The Tech is a cosmopolitan museum singularly focused on technology—how it works and the way that it is changing every aspect of the way we work, live, play and learn. Its people-and-technology focus and the integration of advanced technologies into visitor experiences and infrastructure, distinguishes it from other science centers. The 132,000 square feet of The Tech are shared by four major theme galleries packed full of one-of-a-kind exhibits, the Hackworth IMAX Dome Theater, an educational center for workshops and labs, an upscale cafe, and a retail store featuring books, gifts, and only-in-Silicon Valley items. An estimated 650,000 visitors are expected to trek to The Tech each year, making it one of California's most popular destinations.